Yay! I finally get to show something from the film I'm currently working on - The Legend of the Guardians, directed by Zack Snyder of Watchmen and 300 fame. It's based on the book series The Guardians Of Ga'Hoole by Kathryn Lasky. 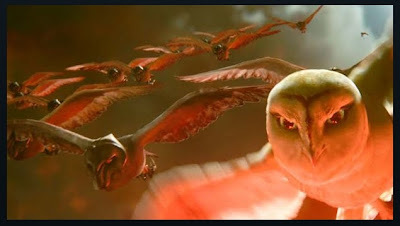 I was fortunate enough to animate two shots for the trailer, one where an ominous group of owls adopt an attacking formation. 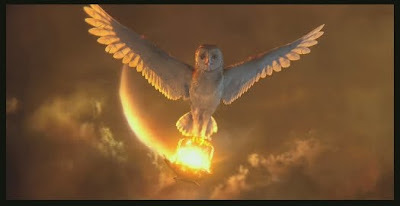 And the shot at the end were a heroic owl rises, carrying a burning lantern. I've been animating a lot of shots in slow motion on this film, something I've never done before. It poses quite an interesting challenge, I'll have to write a post about it soon. There's a lengthy article about the film here for anyone who wishes to find out more.